If we’re all good boys and girls this Christmas, the Department of Health has some treats in store for us next year. Santa Hunt (Jeremy Claus?) is promising improved access to our GPs seven days a week, which is sure to put a smile on a lot of faces if not thousands of votes in the ballot box. That old fashioned, corner-shop style of Primary Care is just no longer fit for purpose, you see. We all now want 24/7 access to GPs like Tesco gives us to microwavable creamy carbonara. And so surgeries right across England are being ‘encouraged’ to think about working in consortia to enable longer opening hours, and Clinical Commissioning Groups (CCGs), which currently manage various aspects of Primary Care, are to be given much broader powers to re-design GPs’ Terms of Service in order to force these co-commissioning consortia into existence against anticipated resistance. Not quite. This is one of those gifts where the packaging and wrapping might just be more thrilling than the contents. Co-commissioning refers to CCGs sharing with NHS England the responsibility of planning and commissioning re-designed GP services. ‘Commissioning’ in the new context means “This is what we want and if you GPs won’t supply it we’ll take the money and pay someone else who will.” That’s to say, it’s a unilateral re-writing of the GP contract. Seven-day access is a current political imperative and so GPs are being ‘invited’ to explore collaborative working as a means of enabling this. It’s a bit like asking the turkey to help choose the best butcher’s knife for carving. The really helpful ones might also volunteer a neat three-step basting technique. But ‘their doctor’ is about to get very busy with other doctors’ patients. The problem with forging consortia of surgeries is that ‘my GP’ will be spread thinner, forced into a rota to cover seven-day working, and become less accessible to me because he’ll be preoccupied with other surgeries and seeing their patients. 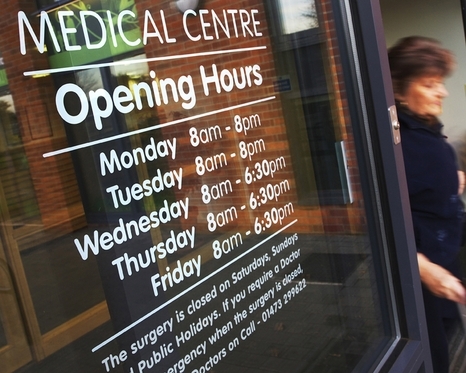 Sure, it’ll be easier to see a GP at more convenient times, but at the expense of the ‘my GP’ aspect of Primary Care. I really quite liked the guy who used to run the local butchers, with his array of freshly-carved meats strewn across his counter, attentive to the quality of every cut. And I loved the couple who ran the fruit and veg store as well, with their tales of market visits at 4.30am to select the best seasonal produce. I was saddened when they closed due to the Tesco effect, but I guess that loss was compensated for, in a way, by 24/7 convenience. And yet I feel sure I’ll miss ‘my GP’ more. I guess modernisation is inevitable, but we really do need to reflect a little on the tradition we’ll lose. HEE is tasked with the job of recruiting GPs and they’re planning to increase the training intake by 15 per cent next year in order to meet the co-collaborative need. You have to admire the optimism. Despite their strenuous efforts, the numbers recruited to GP-land have fallen over recent years due mainly to the job becoming ever more unpalatable as the public are promised more and more from less and less. A shrinking workforce cannot expand its output without cutting services, and young doctors aren’t overly keen on conveyer-belt care. Perhaps HHE should start by persuading turkeys to vote for Christmas, and once they’ve mastered that hominoid culling, move on to medical graduates. Should that fail, HEE do have a Plan B, and you read it on ConHome first. It’s the obvious solution to the GP manpower crisis since there’s little prospect of General Practice becoming a favourable career option for our home-grown medical graduates any time soon. Stay tuned and next week I’ll be predicting the Christmas lottery numbers. This entry was posted in Health, Politics and tagged Department of Health, GPs, Health Care, Jeremy, NHS by admin. Bookmark the permalink.